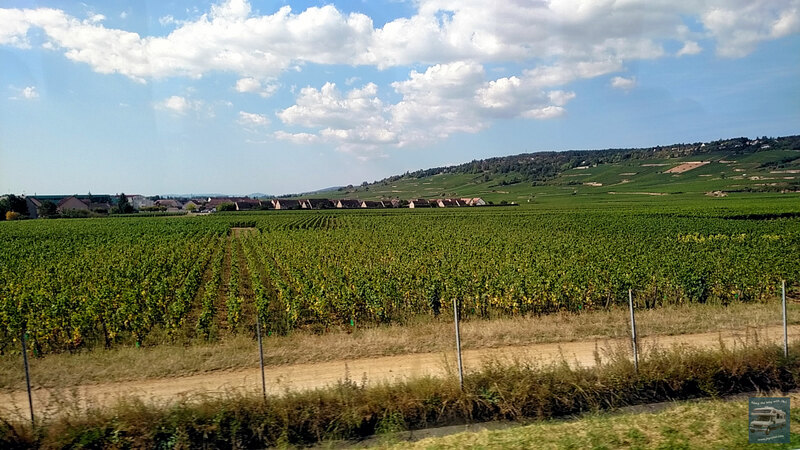 On the morning of Day 5, we bid adieu to Paris and continued our journey on the Road to Rome with a scenic ride through France’s Burgundy region. This part of the country is famous for many different wines, such as Pinot Noir, Chardonnay, and of course, Burgundy. You can also thank Burgundy for Dijon mustard. Dijon is the region’s capital city and famously combined white wine and brown mustard seeds to create this tasty condiment during the Middle Ages. After crossing the border into Switzerland, Ruth gave us with a quick tutorial in Swiss German and before we knew it, we were saying “Grüezi!” to the beautiful town of Lucerne. Lucerne is the most populous town in central Switzerland and offers a unique combination of architecture and culture to entice visitors from all over the world. It is also a shopping mecca, showcasing the best of Swiss craftsmanship. From watches and clocks to chocolate and cheese, you’d be “cuckoo” not to indulge a little! We were super excited to get off the coach and explore the area after a long day of travel. Our first stop was the “Lion of Lucerne”. This famous monument is dedicated to several hundred Swiss Guards who were massacred while protecting Tuileries Palace during the French Revolution. 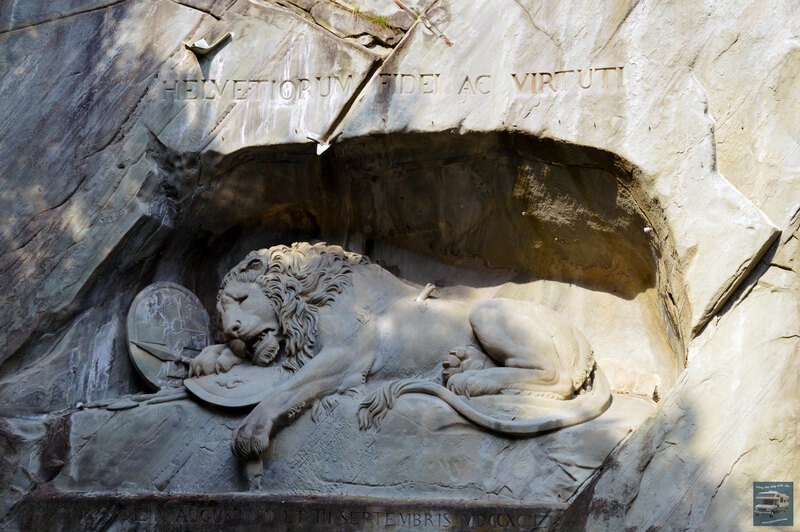 The stunning memorial is carved into rock and portrays a lion, wounded and dying, with his head resting on a shield bearing the “fleur-di-lis”, a symbol of the French monarchy. Around the lion is a small pond, which provides a serene resting place for the brave and mournful warrior. Our hotel for the next two nights was Hotel Astoria. We loved the modern design of this hotel and the fact that there was rooftop bar with a 360-degree view of the city. Unfortunately, we never made it up to the top but had no problem hearing the bass-heavy dance music that pulsated throughout the building during our stay. There is supposed to be strict noise ordinance in Switzerland, but Hotel Astoria definitely did not get that memo! If you prefer a quieter environment, you may want to stay elsewhere. 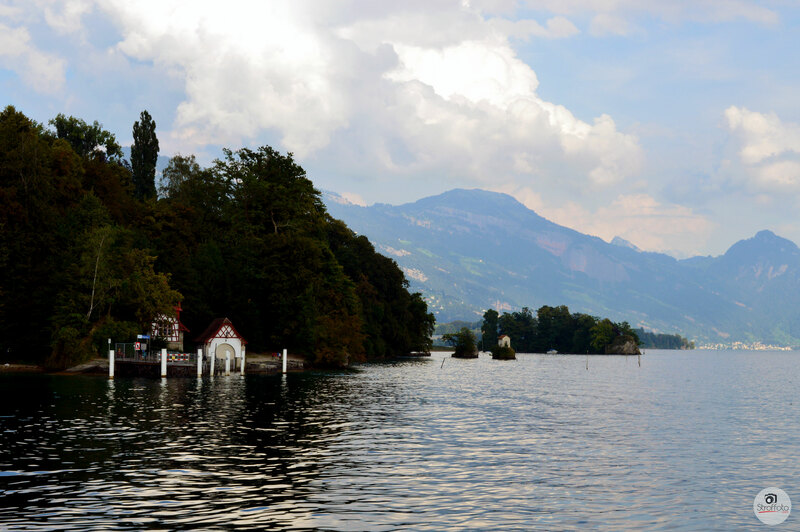 Switzerland is one of many landlocked countries in Europe, but you would hardly miss the ocean after seeing beautiful Lake Lucerne. We took advantage of the optional Happy Hour cruise organized by Insight Vacations and enjoyed a couple glasses of wine as we sailed around the lake. As twilight approached, the Swiss Alps provided a stunning backdrop and the remaining sun created a dazzling light show on the water. It was just one of many moments that made our trip magical and reminded us how fortunate we were to be there! After the cruise, we walked back to the hotel to freshen up before heading out again for an evening stroll. We spent some time on Chapel Bridge, or “Kapellbrücke”, a popular local attraction and the oldest surviving truss bridge in the world. The bridge features unique triangular shaped paintings dating back to the 17th century, most of which were destroyed in a fire in 1993. We also walked to The Church of St. Leodegar, one of many churches in Lucerne, and hung out at the rail station for a bit to people watch after grabbing a bite to eat. Check back soon to read more about our time in Switzerland! 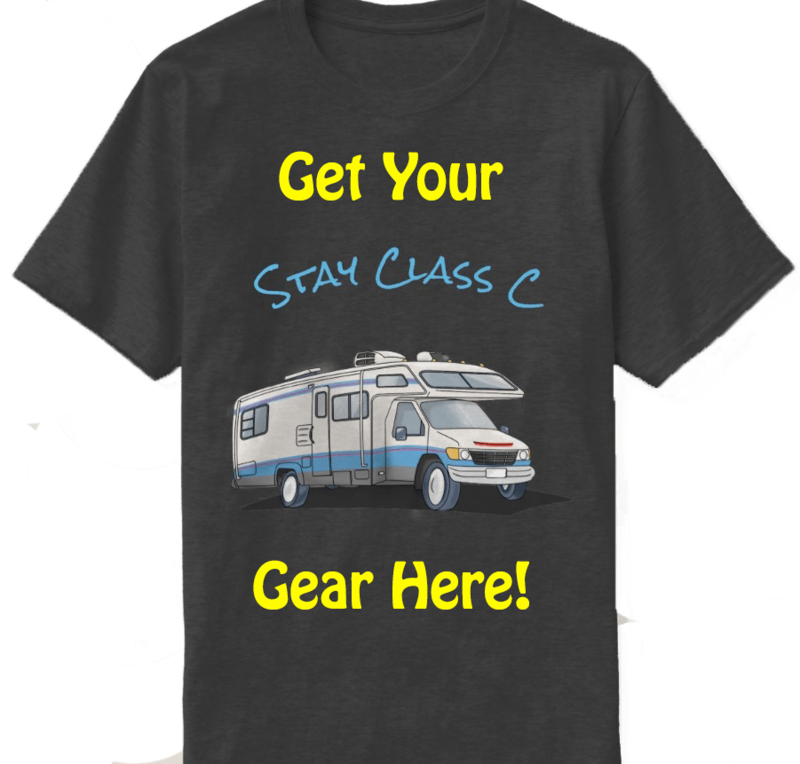 You’re very welcome and thanks for visiting!